It’s not often Don’s on the other side of the camera, but he stood still long enough for his wife Carmen to capture him on film at Coles Bay. 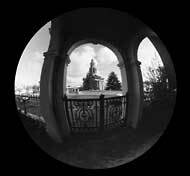 This view of St Georges Church, Battery Point, framed by the arches of a nearby verandah, won for Don Stephens the Commercial Bank of Australia award in 1967 and a cheque for $1,000. 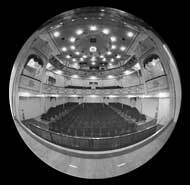 A favourite fisheye photograph of the beautiful interior of the Theatre Royal, Hobart. By PATSY HOLLIS | Outstanding Hobart-based photographer Don Stephens started his career on The Mercury in 1953 as the temporary replacement for an employee sent to London for nine months. Nine months ended up being 38 years. His interest in photography began when his father bought his schoolboy son a Box Brownie, and later the plastic Baby Brownie. Don would walk around the streets of Hobart snapping away enthusiastically. When he left school he took up a photolithography apprenticeship, although that wasn't his dream at the time. 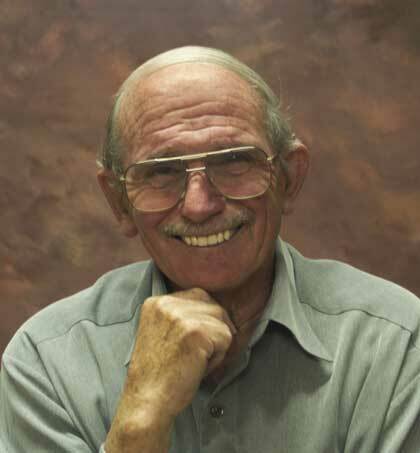 "I really wanted to be a missionary," he says. Fate, however, stepped in. "I went to the mainland to train but found it diffcult to get a job to support myself while I was studying. So I came back to Hobart and took up the offer of a temporary position on The Mercury." Although starting off there with commercial work for advertisers and printing reader's requests, he soon was asked to combine this with the cut and thrust of news photography. In that role Don's brief was to cover anything and everything that was making news on the day — from the tragedies of the Tasman Bridge collapse and 1967 bushfires to covering events such as the Sydney-Hobart yacht race finish each year or simply looking for pretty girls to adorn the front page of the Saturday Evening Mercury. Not only did he do so with a keen newshawk's sense of moment, his pictures were composed with a great deal of artistry. Over the years he won six top photographic awards and has had 12 solo exhibitions. 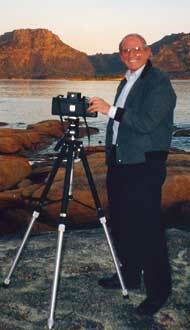 His favourite camera is an Mamiya RB6x7, and with it and a tripod he also created memorable images of Tasmania in its many moods. Boats of all kinds fascinated him and some of his best work records stormy skies towering over yachts, huge international liners, the boats that carried our apples to overseas, every ferry on the Derwent.